For gaming enthusiasts, the Alienware devices from Dell have always been the pinnacle of performance. But Alienware laptops are large, heavy and anything but portable. That is set to change with their new device. 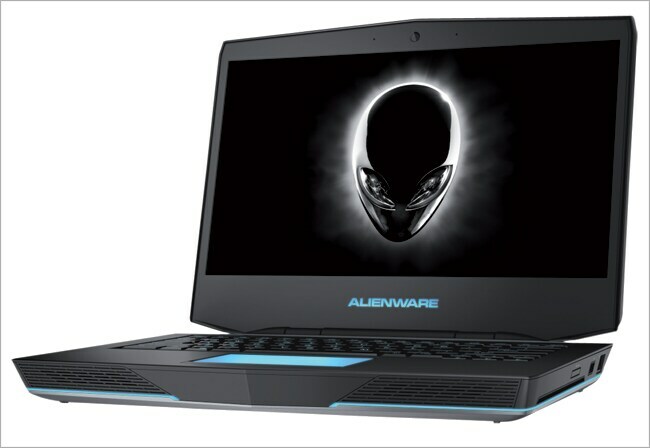 With a 14-inch IPS Full HD screen, the Alienware 14 will easily fit in a large backpack. The new design will remind you more of a spaceship, maybe even a stealth bomber or submarine. The front facing grilles give it a sort of mean look. There are lines and grooves all over the anodized aluminum shell to keep the design busy. The iconic alien head shines at the back. Almost half the base is taken by vents to keep this mean machine cool. Still it does get a bit too hot to handle for you laps. With a weight of 2.7 kg, this one is not meant to be kept on your lap. The 14 is not going to so much as shiver with the toughest games in the planet. We tested the device with Need For Speed Most Wanted and the responsiveness was amazing. The M14 does heat up quite a bit, but much lesser than the larger models we have tested before. The battery is not all that great and lasts a maximum of four hours. But that is a common problem. Despite the all-black body, the 14 is a riot of colour with a backlit keyboard and trackpad. The colours of the backlit trackpad can alos be customised like that of the keys and that too in multiple combinations. This AlienFX system lighting lets you set a myriad number of colour combinations. The keys are very sturdy with reinforced plates below and have the right travel. The screen is crisp with good viewing angles. But we doubt if a screen this size will satisfy all gamers. The audio is really good thanks to the 5.1 speakers powered by Dolby Home Theatre v4 and Klipsch. It is undoubtedly the loudest speakers for any laptop this size. You can also plug this to a 7.1 system through HDMI.